Producing a powerful marketing concept can serve as the backbone for a multitude of products. Jace Pharmaceuticals was a national distributor of a variety of medications and was looking to give new life to their corporate identity with a stronger marketing platform. What better way to revamp an entire campaign than to include materials that cross all media, from print to online? Dynamic Digital Advertising was chosen to take on this task because of our ability to do just this. As a full-service digital marketing company, DDA provided graphic design and copywriting services for print materials, custom website design and development, and video production. DDA was ready to accept the challenge of creating a unified marketing campaign that covered a variety of platforms while maintaining its market-driven focus. DDA would work with Jace Pharmaceuticals to establish the overall theme that would become the basis of all future marketing platforms. DDA graphic designers and copywriters would work on slogans and motifs that relayed impactful marketing messages. The combination of striking designs and engaging copy would yield robust print marketing materials for distribution to a target audience as well as an attractive online presence to broaden the company’s reach. In Stock, On Time, & Secure. This is the message that DDA integrated across all media and used to tie the Jace Pharmaceutical marketing campaign together. The entire message spanned the trade show banner, sections of it were strategically placed in graphics around the trade show booth, and each section was explained in the brochure, narrated in the video, and placed within the framework of the website. All materials utilize an attractive design crafted by DDA’s graphic designers that showcased key points of Jace’s exceptional pharmaceutical services in an industry that demands uncompromising accuracy and fast deliveries. In order to stand out among exhibitors at an international trade show, DDA designed a large-scale, linear graphic to be hung from the ceiling on the venue over Jace’s trade show booth, attracting attendees from all areas of the room. The trade show booth itself consisted of three segmented displays to feature the DDA-produced video, brochure, as well as a sitting area where sales associates could meet with prospective clients. The DDA-produced video was also formatted to be distributed by mail and integrated into the Jace website. 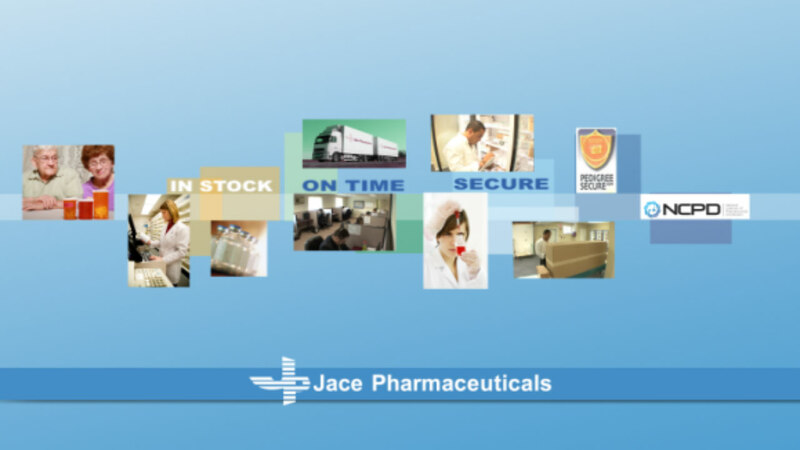 For the video, DDA provided scriptwriting, voiceover talent, and video editing services to produce a short but informative and entertaining package, successfully conveying Jace Pharmaceutical’s core capabilities and unique services. Designed, written, and developed by DDA, the Jace Pharmaceuticals redesigned website exhibited a strong corporate identity through a smart and clean design and market-focused copywriting. In addition to the integrated promotional video which played automatically for first time visitors, DDA programmed engaging Flash transitions to bring about eye-catching action throughout the user-friendly and visually appealing website.